Before trading your iPhone or lending it to a friend/sibling, reset your iPhone 4/4s is a must thing to do. Just like your personal computer or laptop entails all of your secret and confidential data, your iPhone 4/4s must be carrying some traces of private data that you might even know about. After all, who would prefer sharing his personal collection of photos, videos, chat and call history with others? There lie real reasons behind why we need to reset iPhone 4/4s to factory settings before letting it go. Moreover, if your iPhone 4/4s isn’t functioning properly you can try reset it to factory settings to fix the issue. Here are a couple of common ways which will help you for how to reset iPhone 4/4s to factory settings. Erasing your private data from iPhone. Wiping out data through the manual Factory reset option is just not enough to eradicate your data permanently. Only with some advanced iPhone erasers, can permanent reset be achieved. iMyFone Umate Pro or iMyFone Umate Pro for Mac can do this tough job with a single click. 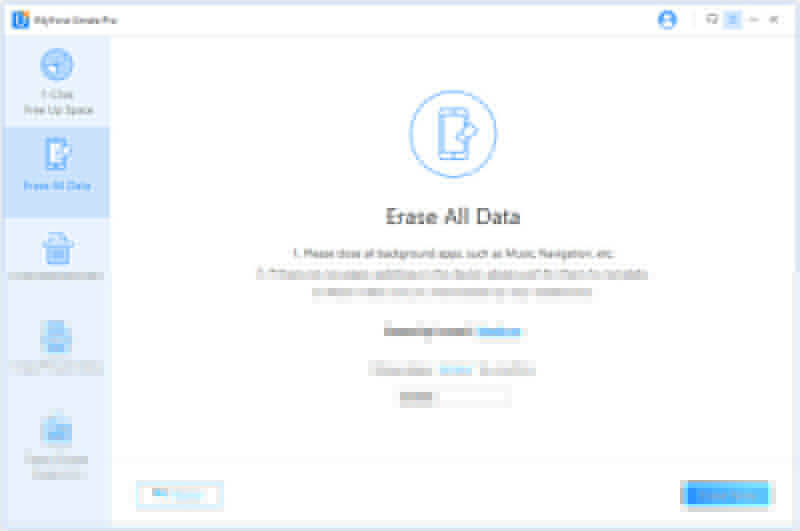 Try out the flawless iMyFone Umate Pro that supports delete or permanently erase everything on your iOS device. With advanced overwriting technology, it promises to eradicate data completely and everything on your device with no chance of recovery even through advanced technology. You don’t have to sit for long hours in front of your computer/laptop screen because the incredible iMyFone Umate Pro knows its job. Step 1. Connect: connect your iPhone 4/4s to computer where iMyFone Umate Pro locates. Step 2. Erase: go to “Erase All Data” tab and hit “Erase” button. Step 3. Confirm: type “delete” into the box and hit “Erase Now” to start the process. 100% Unrecoverable: Data erased by Umate Pro is no longer accessable or recoverable with any recovery tool or by FBI! 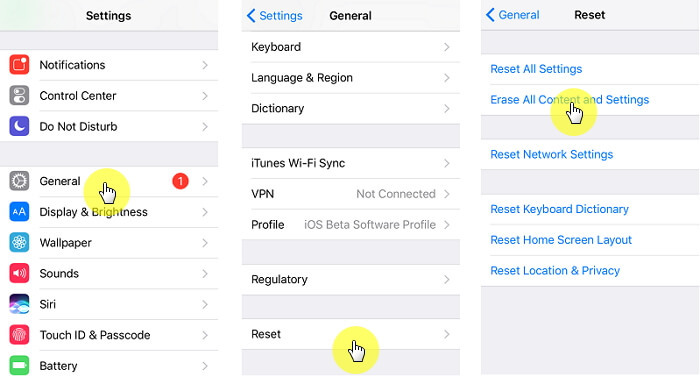 Reset All or Selectively: You can choose to reset the whole iPhone, or preview and reset some of iPhone data. Erase Deleted Files: Previously deleted files which are still recoverable will be found out and permanently erased. Various Data Types: Messages, contact, call history, photos, videos, browsing history, WhatsApp/WeChat/Viber/Kik data, etc. are supported. 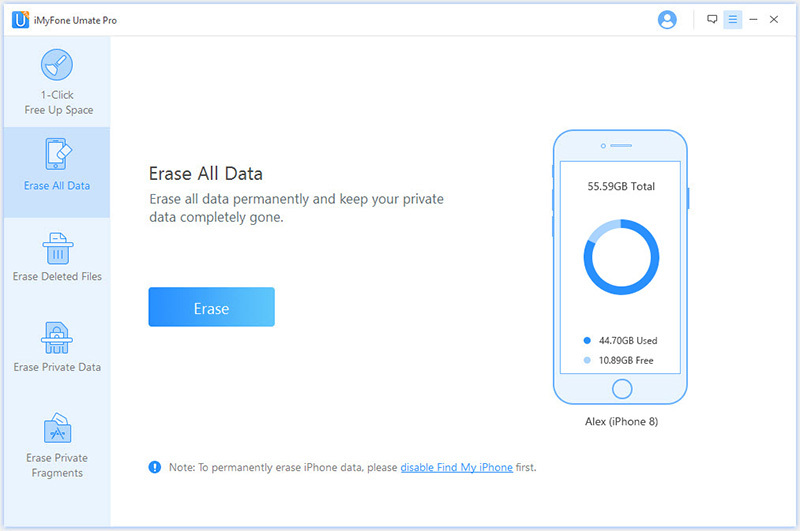 Clean iPhone for Free: It also provides the basci function to free up space, like to clean junk files/temporary files, compress photos, export and delete videos, etc. The "Restore iPhone" feature on iTunes will reset your iPhone 4/4s to factory settings, and also update your iPhone to the latest iOS version. Step 1: So connect your old iPhone 4/4s to computer and launch iTunes. Step 2: When iTunes detects your iPhone 4/4s, click the device icon at the top left corner. Step 3: You will be in the summary page. Choose Restore iPhone from the right panel. Step 4: Click Restore again to confirm. iTunes will start to erase your iPhone and install the latest iOS on your iPhone 4/4s. One simple and convenient technique to factory reset iPhone 4/4s to default settings is via settings on iPhone. It's simple but not safe enough if your want to give away iPhone. Step 1: on your iPhone 4/4s, open Settings app. Step 2: Scroll down and choose General. Step 3: Choose Reset and then select Erase All Contents and Settings. Step 4: Type into your Apple ID password if it requires and confirm it. However, the options above can’t be held safe and reliable because there’s still a chance of recovering data. With some advanced recovery tools, data or files reset can be retrieved in an easy way. Except to permanently reset, hard reset, and restore iPhone 4/4s to factory settings, you still have another way to put iPhone to default settings, using iCloud. Fit for: This way only works when the Find My iPhone is enabled on your device. Besides, your iPhone should be connected to internet. Step 2: Choose Find iPhone there. Step 3: Click All Devices there. It will show you all the devices which are signed in this Apple ID. Choose your iPhone 4/4s. Step 4: It will show you the window of the selected iPhone. Tap Erase iPhone and confirm this action. It will help you to remotely wipe all the data from your iPhone 4/4s. It's suggested to back up your iPhone 4/4s data first before you reset it. 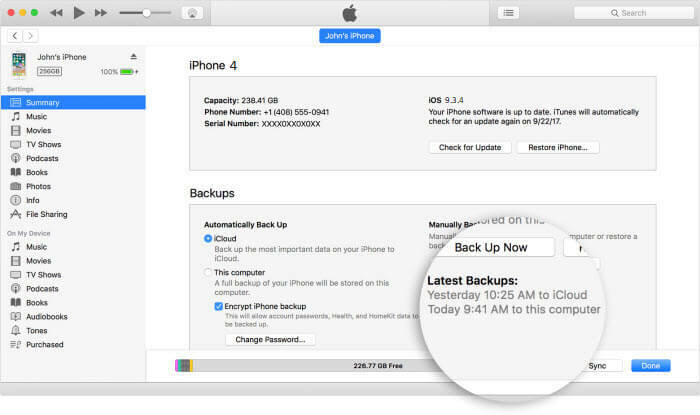 Why to Backup: If you plan to place old iPhone 4/4s with new iPhone, you'd best back it up and then you can restore backup to new iPhone. Your important data won't be lost. But if you plan to place your iPhone with android/windows phone, you can use some special tools to restore backup to the new phone. Backup makes you easy to set up new phone. 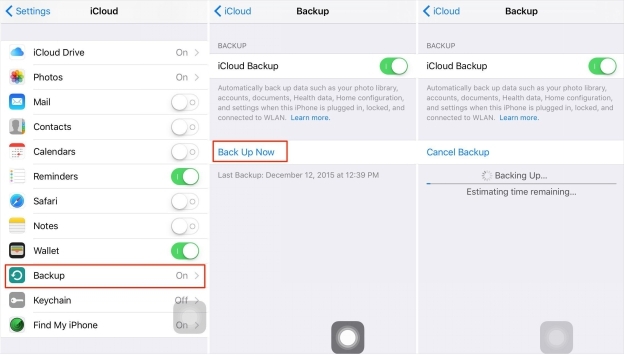 If your prefer backing up iPhone wireless, choose iCloud for backup. But it only has 5GB free space. If you have a computer, you can back up with iTunes. Your iPhone doesn't need to have the internet. What to do if you reset an iPhone that wasn't backed up? Make sure your iPhone 4/4s is connected to Wi-Fi. On iPhone, go to Settings > iCloud. Tap Back Up Now. Stay connected to your Wi-Fi until this process finishes. How to Confirm Backup Completed? Just go to Settings > iCloud > Backup. You will see the date and time of the last backup under "Back Up Now". Connect your iPhone 4/4s to computer and launch iTunes. Choose Back Up Now option from the right panel. Keep your iTunes connected to computer until this process completes. How to Comfirm Backup Complete? Still in the right panel, you will see the Latest Backups with date and time under "Back Up Now" button. You may have already reset iPhone but you forgot to make backup. Don't worry, you still have the chance that there's backup you're unaware of. To figure out if you're backing up iPhone to icloud, go to Settings > iCloud > Storage > Manage Storage. Here you will see your various backups for all of your devices. There would be a backup says "This iPhone". Tap on it and you can see what is. To check when your iPhone last backed up, go to Settings > iCloud > Backup. It will show you the date and time of last backup under "Back Up Now". It would have happened that last time you plugged your iPhone into charge and connected to Wi-Fi as well. It happens automatically.